The members of the Nineteenth Alaska State Legislature join the family and friends of Joe Vogler in honoring his life and his many accomplishments. Joe Vogler was born on April 24, 1913, in Barnes, Kansas. One of five children raised on a Kansas farm, he learned to work hard and think for himself. In 1929, at 16 years of age, Joe Vogler attended the University of Kansas on a scholarship. He graduated in five years with a law degree and was admitted to the Kansas State Bar at the age of 21. 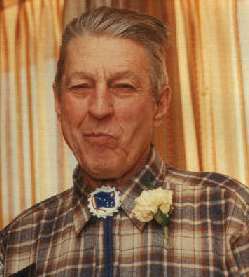 Vogler came to Alaska in March of 1942 and worked for the Army engineers at Ladd Air Field in Fairbanks until 1951 when he began mining on Homestake Creek. He spent fifty years "moving dirt" as a miner and real estate developer in Interior Alaska. Vogler's hero was Thomas Jefferson who he described as the "greatest political thinker who ever lived." As he thrust out his calling card, a pocket-sized U.S. Constitution, Joe stressed in his political debates that he believed the biggest problem with the federal government was that they have overstepped the bounds of the Constitution. Vogler challenged the federal government's practice of owning land in Alaska or any other state outside the original limits of the United States Constitution. Vogler believed that federal claims of land for preserves and parks is outside of the original intent of the framers of the Constitution and that the federal government has no right to own land in the western states except for "forts, arsenals, dockyards and other needful government uses. As an independent Alaskan who will long be remembered for his love of Alaska and politics, as well as his biting wit, Vogler was a pioneer with vision, courage and determination. Although Joe was defeated in his three gubernatorial races, he felt that the "shift back toward constitutional government" on the part of Alaska's political leaders was "a victory of sorts." "Government is not the giver of rights; only God confers these to the people. People create government, giving it certain and limited powers. Only eternal vigilance by the people will confine government to its proper role." "Where is Joe? On any clear night, we can look up to the sky and find the eight stars--the Big Dipper and the North Star--symbols of Alaska. Joe Vogler is up there." The members of the Nineteenth Alaska Legislature extend their condolences to Joe's sister, Maxine; his two brothers, Dee and Dworel; and his nephew, Lynn. Joe Vogler will always be remembered, loved, respected, and missed by all who were fortunate to have had Joe touch their lives.